Sindhi (/ˈsɪndi/; سنڌي‎, सिन्धी, , ਸਿੰਧੀ) is an Indo-Aryan language of the historical Sindh region in the northern part of the Indian subcontinent, spoken by the Sindhi people. It is the official language of the Pakistani province of Sindh. In India, Sindhi is one of the scheduled languages officially recognized by the central government, though Sindhi is not an official language of any of the states in India. This article contains Sindhi text, written from right to left with some letters joined. Without proper rendering support, you may see unjoined letters or other symbols instead of Sindhi script. The Indian Government has legislated Sindhi as a language of option and a medium of study in India, so that students can choose to learn Sindhi. Sindhi is an optional third language in the Indian states of Rajasthan, Gujarat and Madhya Pradesh. Prior to the inception of Pakistan, Sindhi was the national language of Sindh. There are many Sindhi language television channels broadcasting in Pakistan such as KTN, Sindh TV, Awaz Television Network, Mehran TV and Dharti TV. Besides this, the Indian television network Doordarshan has been asked by the Indian High Court to start a news channel for Sindhi speakers in India. The name "Sindhi" is derived from Sindhu, the local name of the Indus River. Like other languages of this family, Sindhi has passed through Old Indo-Aryan (Sanskrit) and Middle Indo-Aryan (Pali, secondary Prakrits, and Apabhramsha) stages of growth, and it entered the New Indo-Aryan stage around the 10th century CE. In the year 1868, the Bombay Presidency assigned Narayan Jagannath Vaidya to replace the Abjad used in Sindhi, with the Khudabadi script. The script was decreed a standard script by the Bombay Presidency thus inciting anarchy in the Muslim majority region. A powerful unrest followed, after which Twelve Martial Laws were imposed by the British authorities. According to Islamic Sindhi tradition, the first translation of the Quran into Sindhi was completed in the year 883 CE / 270 AH in Mansura, Sindh. The first extensive Sindhi translation was done by Akhund Azaz Allah Muttalawi (1747–1824 CE / 1160–1240 AH) and first published in Gujarat in 1870. The first to appear in print was by Muhammad Siddiq (Lahore 1867). When Sindh was occupied by British army and was annexed with Bombay, governor of the province Sir George Clerk ordered to make Sindhi the official language in the province in 1848. Sir Bartle Frere, the then commissioner of Sindh, issued orders on August 29, 1857 advising civil servants in Sindh to qualify examination in Sindhi. He also ordered Sindhi to be used in all official communication. Seven-grade education system commonly known as Sindhi-Final was introduced in Sindh. Sindhi Final was made a prerequisite for employment in revenue, police and education departments. Sindhi has a relatively large inventory of both consonants and vowels compared to other languages. Sindhi has 46 consonant phonemes and 16 vowels. The consonant to vowel ratio is around average for world's languages at 2.8. All plosives, affricates, nasals, the retroflex flap and the lateral approximant /l/ have aspirated or breathy voiced counterparts. The language also features four implosives. The retroflex consonants are apical postalveolar and do not involve curling back of the tip of the tongue, so they could be transcribed [t̠, t̠ʰ, d̠, d̠ʱ n̠ n̠ʱ s̠ ɾ̠ ɾ̠ʱ] in phonetic transcription. The dental implosive is sometimes realized as retroflex [ɗ̠]~[ᶑ] The affricates /tɕ, tɕʰ, dʑ, dʑʱ/ are laminal post-alveolars with a relatively short release. It is not clear if /ɲ/ is similar, or truly palatal. /ʋ/ is realized as labiovelar [w] or labiodental [ʋ] in free variation, but is not common, except before a stop. The vowels are modal length /i e æ ɑ ɔ o u/ and short /ɪ̆ ʊ̆ ɐ̆/. (Note /æ ɑ ɐ̆/ are imprecisely transcribed as /ɛ a ə/ in the chart.) Consonants following short vowels are lengthened: [pɐ̆tˑo] 'leaf' vs. [pɑto] 'worn'. Sindhi has borrowed from English and Hindustani. Today, Sindhi in Pakistan is slightly influenced by Urdu, with more borrowed Perso-Arabic elements, while Sindhi in India is influenced by Hindi, with more borrowed tatsam Sanskrit elements. The following extract is from the Sindhi Wikipedia about the Sindhi language and is written in the 52-letter Sindhi-Arabic script, Devanagari and transliterated to Latin. Transliteration (ISO): Sindhī b̤olī iṇḍo yūrapī khāndān sā̃ taʿlluqu rakhandaṛ āryāī b̤olī āhe, janhin te drāvidi boli-a jo tamaam waddo asar-u aahe. Hin-a vaqtu sindhī b̤olī sindh jī mukh b̤olī ãĩ daftarī zabānā āhe. The dialects of Sindhi include Vicholi, Lari, Lasi, Kathiawari Katchi, Thareli, Macharia, Dukslinu and Muslim Sindhi. The "Siraiki" dialect in northern Sindh is distinct from the Saraiki language of South Punjab and has variously been treated either as a dialect of it, or as a dialect of Sindhi. The Sindhi dialects previously known as "Siraiki" are nowadays more commonly referred to as "Siroli". Written Sindhi is mentioned in the 8th century, when references to a Sindhi version of the Mahabharata appear. However, the earliest attested records in Sindhi are from the 15th century. Before the standardisation of Sindhi orthography, numerous forms of the Devanagari and Lunda (Laṇḍā) scripts were used for trading. For literary and religious purposes, an Arabic-Persian alphabet known as Ab-ul-Hassan Sindhi and Gurmukhi (a subset of Laṇḍā) were used. Another two scripts, Khudabadi and Shikarpuri, were reforms of the Landa script. During British rule in the late 19th century, a Persian alphabet was decreed standard over Devanagari. Medieval Sindhi devotional literature (1500–1843) comprises Sufi poetry and Advaita Vedanta poetry. Sindhi literature flourished during the modern period (since 1843), although the language and literary style of contemporary Sindhi writings in Pakistan and India were noticeably diverging by the late 20th century; authors from the former country were borrowing extensively from Urdu, while those from the latter were highly influenced by Hindi. Laṇḍā-based scripts, such as Gurmukhi, Khojki and the Khudabadi script were used historically to write Sindhi. The Khudabadi alphabet was invented in 1550 CE, and was used alongside other scripts by the Hindu community until the colonial era, where the sole usage of the Arabic script for official purposes was legislated. The script continued to be used in a smaller scale by the trader community until the independence of Pakistan in 1947. Khojki was employed primarily to record Muslim Shia Ismaili religious literature, as well as literature for a few secret Shia Muslim sects. The Gurmukhi script was also used to write Sindhi, mainly in the North of Sindh, and also by Hindu women. During British rule in India, a variant of the Persian alphabet was adopted for Sindhi in the 19th century. The script is used in Pakistan today. It has a total of 64 letters, augmenting the Persian with digraphs and eighteen new letters (ڄ ٺ ٽ ٿ ڀ ٻ ڙ ڍ ڊ ڏ ڌ ڇ ڃ ڦ ڻ ڱ ڳ ڪ) for sounds particular to Sindhi and other Indo-Aryan languages. Some letters that are distinguished in Arabic or Persian are homophones in Sindhi. Farsi (perso-arabic) or Shikarpuri Sindhi. In India, the Devanagari script is also used to write Sindhi. A modern version was introduced by the government of India in 1948; however, it did not gain full acceptance, so both the Sindhi-Arabic and Devanagari scripts are used. In India a person may write a Sindhi language paper for a Civil Services Examination in either script . Diacritical bars below the letter are used to mark implosive consonants, and dots called nukta are used to form other additional consonants. The Gujarati script is used to write the Kutchi Language in India. The Sindhi-Roman script or Roman-Sindhi script is the contemporary Sindhi script usually used by the Sindhis during texting messages on their mobile phones. A Sindhi writer Haleem Brohi was the staunch advocate of the Roman-Sindhi script and he also wrote book for that script. Sindhi language software such as Sindhi language keyboards have been developed for the Windows OS, Android smartphones. Various other online websites provide Sindhi keyboard such as (Keymanweb.org), M.B Sindhi keyboard by Majid Bhurgri. Software has also been developed for the transliteration between the main writing systems. ^ a b Gulshan Majeed. "Ethnicity and Ethnic Conflict in Pakistan" (PDF). Journal of Political Studies. Retrieved December 27, 2013. ^ a b "Sindhi". The Languages Gulper. Retrieved December 27, 2013. ^ a b "Encyclopædia Britannica". Sindhi Language. Retrieved December 29, 2013. ^ Hammarström, Harald; Forkel, Robert; Haspelmath, Martin, eds. (2017). "Sindhi". Glottolog 3.0. Jena, Germany: Max Planck Institute for the Science of Human History. ^ Hammarström, Harald; Forkel, Robert; Haspelmath, Martin, eds. (2017). "Sindhi Bhil". Glottolog 3.0. Jena, Germany: Max Planck Institute for the Science of Human History. ^ Hammarström, Harald; Forkel, Robert; Haspelmath, Martin, eds. (2017). "Lasi". Glottolog 3.0. Jena, Germany: Max Planck Institute for the Science of Human History. ^ "Languages Included in the Eighth Schedule of the Indian Constution | Department of Official Language | Ministry of Home Affairs | GoI". www.rajbhasha.nic.in. Retrieved 2018-04-09. ^ "Sindhi Language, Sindhi Dialects, Sindhi Vocabulary, Sindhi Literature, Sindhi, Language, History of Sindhi language". www.indianmirror.com. Retrieved 2018-04-09. ^ "National Committee for Linguistic Minorities" (PDF). Archived from the original (PDF) on 2012-05-13. Retrieved 2018-08-13. ^ Language and Politics in Pakistan. "THE SINDHI LANGUAGE MOVEMENT 103 103 7The Sindhi Language Movement". academia.edu. Retrieved 12 September 2015. ^ "The Imposition Of Urdu". NAWAIWAQT GROUP OF NEWSPAPERS. September 10, 2015. Retrieved 12 September 2015. ^ "Microsoft Word - Teaching of Sindhi & Sindhi ethnicity.doc" (PDF). Retrieved 2018-08-13. ^ "404 – tariqrahman" (PDF). tariqrahman. ^ "24hr news channel for Sindhis: HC seeks Centre's response". Business Standard Private Ltd. Press Trust of India. September 4, 2015. Retrieved 12 September 2015. ^ "Sindhi". Accredited Language Services. Retrieved 7 May 2016. ^ "Sindhi". The Languages Gulper. Retrieved January 29, 2013. ^ a b c "Encyclopædia Britannica". Retrieved May 11, 2013. ^ "Sindhi - About World Languages". 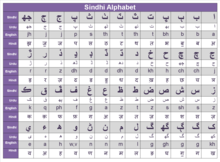 ^ "Sindhi alphabets, pronunciation and language". Omniglot.com. ^ "The Holy Qur'an and its Translators -- Imam Reza (A.S.) Network". imamreza.net. Archived from the original on 15 January 2016. Retrieved 29 March 2015. ^ Naseer Memon (April 13, 2014). "The language link". The News on Sunday. Retrieved April 13, 2014. ^ Nihalani, Paroo. (1999). Handbook of the International Phonetic Association (Sindhi). Cambridge: Cambridge University Press. ^ Paroo Nihalani (December 1, 1995). "Illustration of the IPA - Sindhi". Journal of the International Phonetic Association. Retrieved April 19, 2014. ^ Nihalani 1974, p. 207. ^ The IPA Handbook uses the symbols c, cʰ, ɟ, ɟʱ, but makes it clear this is simply tradition and that these are neither palatal nor stops, but "laminal post-alveolars with a relatively short release". Ladefoged & Maddieson (1996:83) confirm a transcription of [t̠ɕ, t̠ɕʰ, d̠ʑ, d̠ʑʱ] and further remarks that "/ʄ/ is often a slightly creaky voiced palatal approximant" (caption of table 3.19). ^ Masica, Colin P. (1991). The Indo-Aryan languages. Cambridge language surveys. Cambridge University Press. p. 443. ISBN 978-0-521-23420-7. ^ Rahman, Tariq (1995). "The Siraiki Movement in Pakistan". Language Problems & Language Planning. 19 (1): 3. doi:10.1075/lplp.19.1.01rah. ^ Shackle 2007, p. 114. ^ a b "Sindhi Language: Script". Retrieved 15 May 2012. ^ "Gujarati alphabet, pronunciation and language". omniglot.com. Retrieved 29 March 2015. ^ "Romanized Sindhi". Romanized Sindhi.org. Retrieved 7 May 2016. ^ "CHOICE OF SCRIPT FOR OUR SINDHI LANGUAGE". Chandi Ramani. Retrieved 7 May 2016. ^ "Sindhi - Keyboards - Tavultesoft". ^ "KeymanWeb.com - Type to the world in your language". ^ Z .Ali (September 19, 2014). "Transcending barriers: Software to break down the wall within the Sindhi language". The Express Tribune. Retrieved 7 May 2016. ^ Amaninder Sharma (September 3, 2014). "Software to melt India, Pakistan's Sindhi script barrier". Times of India. Retrieved 7 May 2016. Nihalani, Paroo (1974). "Lingual Articulation of Stops in Sindhi". Phonetica. 30 (4): 197–212. doi:10.1159/000259489. ISSN 1423-0321. Addleton and Brown (2010). Sindhi: An Introductory Course for English Speakers. South Hadley: Doorlight Publications. Archived from the original on 2010-08-28. Retrieved 2010-03-18. Bughio, M. Qasim (January–June 2006). Maniscalco, Fabio Maniscalco (ed.). "The Diachronic Sociolinguistic Situation in Sindh". Web Journal on Cultural Patrimony. 1. Cole, Jennifer S (2001). "Sindhi". In Garry, Jane; Rubino, Carl (eds.). Facts About the World's Languages. H W Wilson. pp. 647–653. ISBN 0-8242-0970-2.
International Phonetic Association. 1999. ISBN 0-521-63751-1. Khubchandani, Lachman M (2003). "Sindhi". In Cardona, George; Jain, Dhanesh (eds.). The Indo-Aryan Languages. Routledge. pp. 622–658. ISBN 978-0-415-77294-5. Shackle, Christopher (2007). "Pakistan". In Simpson, Andrew (ed.). Language and national identity in Asia. Oxford linguistics Y. Oxford University Press. ISBN 978-0-19-922648-1. Trumpp, P (1872). Grammar of the Sindhi Language. London: Trübner and Co. ISBN 81-206-0100-9. Chopra, R. M., The Rise, Growth And Decline of Indo-Persian Literature, 2012, Iran Culture House, New Delhi, Chapter on"Persian in Sindh". Ernest Trumpp (1872). Grammar of the Sindhi Language. Wikivoyage has a travel guide for Sindhi phrasebook. Wikimedia Commons has media related to Sindhi language.